There are a few chassis, just depends if you want warp speed or double warp speed. That PRR B1 is already half done. I'll prolly be designing my own drive mech but is that a stndard diesel truck sideframe? Looking at it now it just looks like a self-designed rigid chassis. Any guesses as to the wheel diameter? ...................cut down a Kato steeplecab onto a B-mann 44 or 70 tonner truck? Those trucks do not look anything like the thing in the photograph, but, perhaps you could change the side frames. It would be a challenge trying to power it, though. 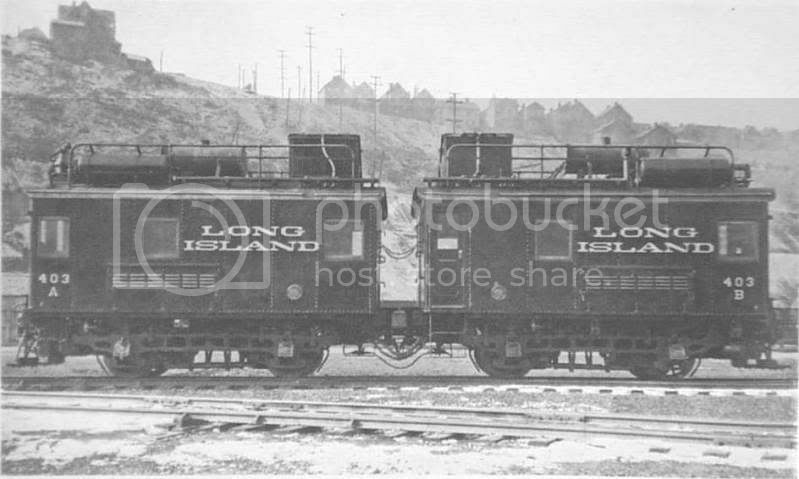 ......build the locomotive as a dummy and couple it to a powered box car? 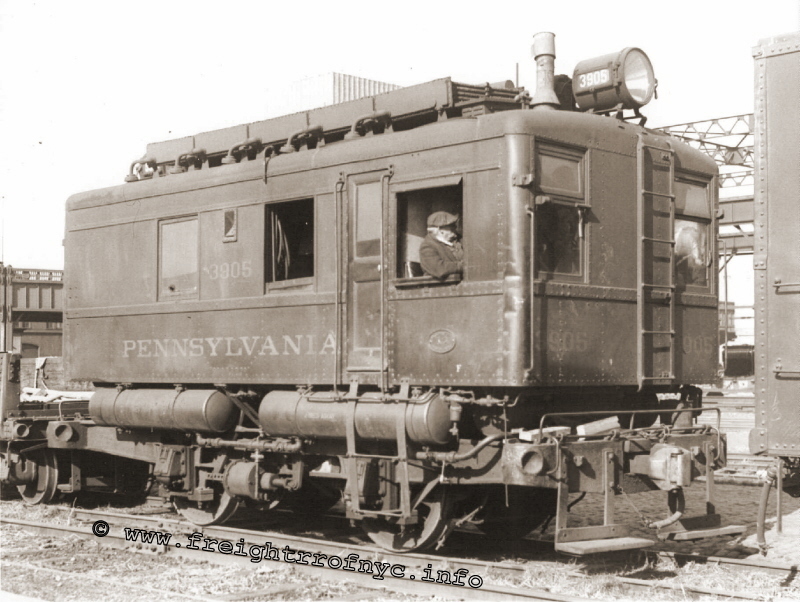 You could even make the truck in the dummy locomotive live for additional contact for the powered boxcar. If you go onto the Plaza Japan Ebay store and just search for 'chassis' you'll find an abundance of tiny little 4-wheel powered chassis in various configurations. I've had several. Without knowing your wheel size, wheelbase and dimensions, it's a crapshoot, but there must be at least 5-8 of them out there right now. The trick is to find one with 4-wheel drive and 4-wheel pickup, and also be aware that just about all of them have a 3v motor of limited means. 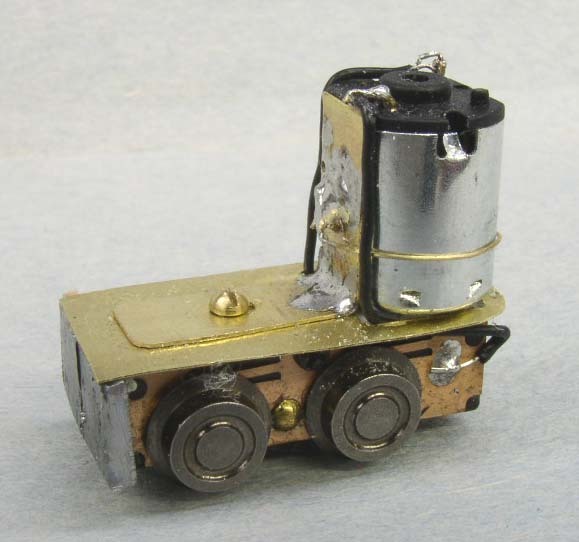 I've built several of the 25-tonners using that drive, the 12V motor, and a shapeways-printed shell. />But there's a lot of other ones out there. The trick isn't to get it to run, it's to get it to not stall. It's all about weight, limited equalization on the wheels so that it doesn't turn into a 3-legged stool, and decent wheels and electrical pickup. I've probably come up with half a dozen variations that all 'work', but practical use is all about weight and pickup. Finding motors and chassis is relatively easy, getting them to run right is anything but. 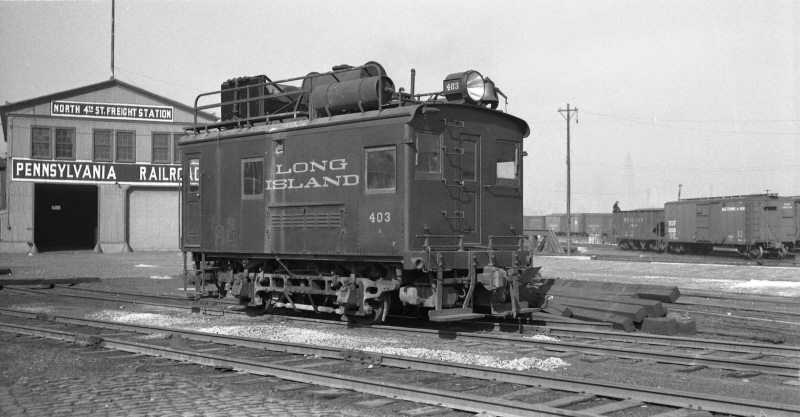 My all-time champ idea of tiny mechs was powering the Railway Express burro crane with something like that, with cast metal it weighed a ton and had excellent pickup, mated to a 40' flatcar with Kato caboose trucks for electrical pickup under it it became electrically bulletproof as well. So if there's a way to 'marry' your tiny critter to a car like a tender with electrical pickup on it, THEN you have a real winner. That PRR B1 is already half done. Correct, it is an A class wheel arrangement! You might be able to scale it off of the coupler height. Didn't @cbroughton67 make a critter like thing once? I've built a couple - a pint-size RS3 and a GE 23-ton box cab. @Lemosteam World Craft makes some elegant little mechs that can be found on eBay (search for "tu chassis" under N-scale, and several come up). The one's I'm thinking of (TU-16, TU-14, TU-13) are made from PC board and photo-etched components, but the platform height is too tall for the critter you want to make. Could you design a similar mech based on their design (PE parts connected to a PC board "frame")? One with a vertical center-mounted motor that drives one axle directly, then via a second offset gear on the same axle, drives a middle gear that engages the second axle (if any of that makes sense)? I have a TU-13 chassis I can send you if you want to see one first-hand. It's going to be too large for your application, but it might give you some design ideas. The little motors from the Kato 11-105/6/7 are 12V and pretty tough for their size. They are identical in case size to the Gizmoszone 3V motors in their gearheads, so when I have the room I pair them off with a 5:1 gearhead. But for the tiny critters, it's almost worth the fight to see if you can swap out those micro 3V motors with one of these because the tiny ones have virtually no torque at all. They will move under their own power for sure, but practical use is another thing entirely. This is what's under the hood on that 25-tonner, a TU7T with a Kato motor. Same approach can work on almost any of these. There are similar chassis with centered motors (worm in the middle instead of on the end) like the other photo shown above. This modification worked quite well for its size. One essential feature of that idea was developing a firm bracket for motor mounting that was adjustable, as the axle/worm tolerance was critical for decent performance. 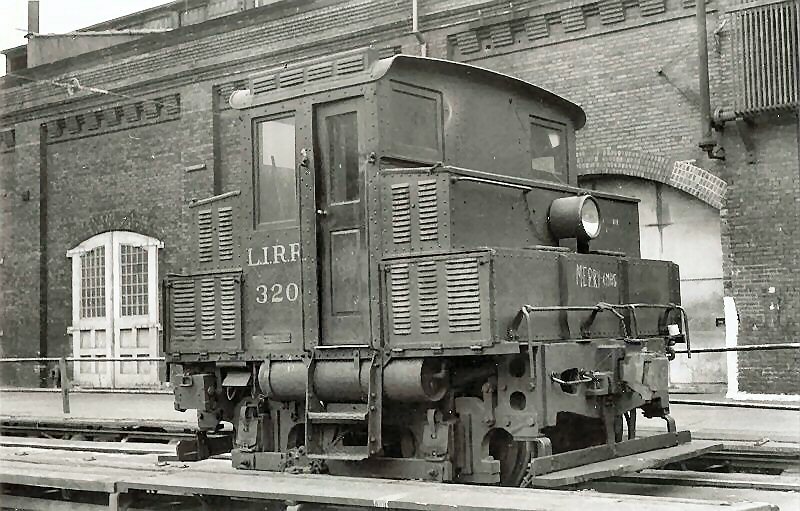 There's a natural tendency for the motor to want to 'lift' the rear axle under load, which was a design feature that plagued my original 25-tonner. It really bugged me until a ran a real 25-tonner and it about bucked me out of the cab seat vertically when it started to slip pulling a heavy load. These critters are fun, but they'll drive you nuts getting them to be a 'viable' locomotive you can actually use other than an 'oh, wow, that actually runs?' thing on the layout.